Remove all weeds from your yard, especially their roots. Then, grab your rototiller and loosen the soil to at least six inches deep. Next, slowly add in loam with sand and topsoil to your yard. Lastly, take a roller to help pack down your yard’s soil and grab a metal rake to go over the freshly soiled area. Seeding by hand has become a recent trend with homeowners because it is widely used by farmers. You will want to seed your front yard to help with growth. You do not want to mow your grass too short; therefore, you should place your mower’s blade on the highest setting. The tall grass will help the yard discourage the growth of new weeds. Your yard only needs to be watered once a week, but it requires deep water. The weekly watering can help deter pests from attaching to your grass. Note: If your grass has been freshly seeded, you will want to water it every day for five to ten minutes. Newly seeded grass needs to be damp, but not soaked. Once your seeds are sprouted, you can begin to water it once a day for fifteen to twenty minutes. Buy a fertilizer that has micronutrients (sulfur, copper, and iron) in it to assure your grass is adequately fed. Also, use dolomitic lime every couple of years to help balance the soil’s pH levels. Mow your yard frequently to remove any weeds before they distribute throughout your lawn. You can take a pair of soccer shoes and walk through your yard to help air out your lawn. This is important for the nutrients and oxygen to move throughout your lawn. Each yard will see different results depending on the grass and climate of your area. For more information on lawn maintenance, visit The United States Department of Agriculture’s website. Thanks for reading! Outdoor lighting is essential, especially during the summertime and holidays. Choosing the appropriate outdoor lighting for your home can become challenging and overwhelming. Before you pick and choose randomly, we want to make sure you know about all your outdoor lighting options. These are perfect for outdoor parties and gathering because they embody the vibes of the islands. Plus, you can get insect repellant tiki torches to help discourage unwanted party crashers. If you are looking to bring indoor beauty to the outdoors, incorporating a chandelier may just be the perfect thing for you. Chandeliers are exquisitely beautiful and draw attention to the lighting by making a bold statement. If you have an outdoor dining area, incorporating a chandelier can add the perfect finishing touches. Do you find yourself stumbling to get inside once it gets dark out? If you do, adding lights to your steps can be a huge lifesaver. You will never have to wonder “where do the steps end” ever again! From paper to glass lanterns, you have a wide selection of styles to choose from when designing your backyard. Lanterns add a warm glow and are very subtle in their beauty. Do not be afraid to hang them from trees, posts or a string above your backyard. Want to create a romantic night? Incorporate some candles throughout your backyard’s dining area to set the tone for the perfect night. Candles add a warmth that many light sources cannot master. We are obsessed with Edison bulbs because they are energy-efficient and stylish. Add stringed Edison bulbs throughout your backyard to create a vintage look. Fire pits add the perfect touch to outdoor gatherings. They provide a warm meeting place on chilly nights as well as a stylish addition to any backyard. Whether you are preparing for the holidays or the summertime, it is never too late to focus on your home’s lighting. Thanks for reading! Curb appeal is your home’s first impression to the public. Not everyone will have the pleasure of coming into your home, but many people will have the opportunity to see your home’s exterior. 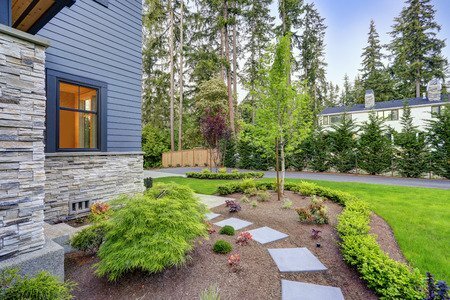 Your curb appeal should never be neglected in your overall home’s design. The exterior of your home has just as much influence on the home’s overall feel as the interior. To make sure that you are giving your exterior the proper attention, we made a list of four curb appeal tips that you cannot neglect! Your lawn is one of the most significant contributing factors to your curb appeal. 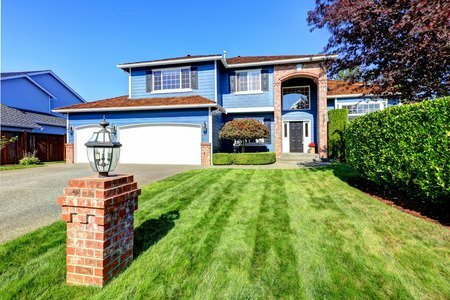 Lawn maintenance is key to making your curb appeal better. This goes further than just mowing your grass or raking leaves. Keep your shrubs trimmed, and your trees hedged. If you have a flower garden, make sure it is well kept. Try to dedicate at least one day a week to lawn maintenance to prevent it from becoming an overwhelming project and to keep up on it. Your main entrance is the gateway to your home. It needs to be easily accessible whether by pathway or sidewalk. Your door can make a great statement towards your overall curb appeal. If your front entry is worn down or outdated, you may want to consider refurbishing your door or replacing it all together. Symmetry can help create balance in your entrance. You may want to invest in plants or a welcoming mat to decorate your home’s front entrance. Windows also play a significant role in your curb appeal. Not only do you want to upgrade your windows for economic reasons but aesthetic reasons as well. Pay close attention to what people can see when looking through your windows from the curbs. If you keep the inside of your home messy but it can be seen from the road, this can hurt your curb appeal as well. Try to get matching curtains for your whole house as well or pay attention to the colors to show your keen eye for detail. Adding curb appeal is essential to your home’s design and overall look. 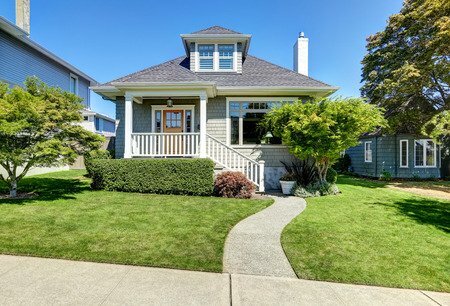 Remember to invest time into lawn maintenance and keep your curb appeal strong. For more great tip and tricks visit us at From The Floors Up. Want the backyard of your dreams, but lack the space? For families that living in small spaces, it can be a challenge to enjoy a tiny outdoor space. So how can you stretch a little square footage into a space that rivals the magazines? 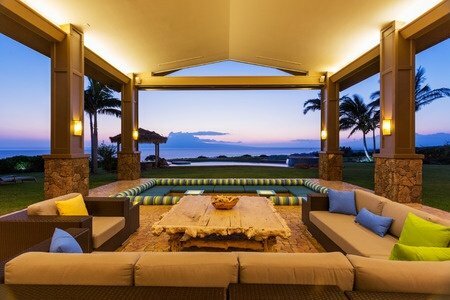 We are going to show you inexpensive ways to maximize limited outdoor space. Let’s take a look! 1. Take Advantage of the View. When arranging your outdoor furniture, you need to capture the widest point of view; therefore, you will need to avoid positioning your furnishing against the house, especially if plants, a fence, or other elements are obscuring the view. Find out what areas in the yard allow for a clear view of the length of your backyard. Since you want to fully enjoy your backyard retreat, you do not want to place too much emphasis on plant life. Sometimes a garden can take up too much space in your backyard. Opt for a few low-maintenance potted or container plants that are a few inches tall. They can be easily moved so that they do not obscure the view, but still, fulfill your need for the wildlife. When shopping for outdoor furniture, you should lean more towards smaller-scaled furniture for a small backyard. Pick out pieces that feature thin frames and petite seating areas. 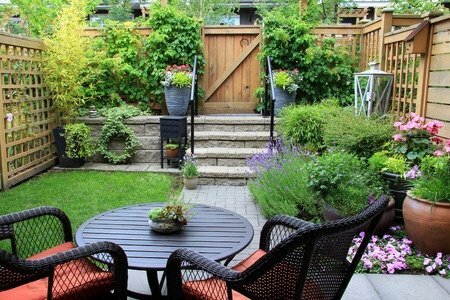 For example, round bistro-style tables and chairs are perfect for a tiny backyard. Invest in furniture that is multifunctional. Tables that serve as seating options and ottoman style tables that allow you to store items can be a perfect choice! You will need to consider your furnishing needs before making the final decision. Elaborate outdoor furniture may look stylish but is it ideal for your lifestyle? If you do not plan on entertaining guests, you may be best suited with modest, simple type of furnishing. Keep it simple when coordinating colors for your outdoor living space. Implementing too many different types of accents, colors and plants will make the space look chaotic and disorganized. Choose a couple of your favorite colors, make sure that they harmonize with one another and add in accessories that embrace the palette. Check back weekly for more design tips and tricks! Thanks for reading. Are you looking for budget-friendly and quick updates that make for amazing curb appeal? Then you came to the right place! With our top six tips, you can have your neighborhood’s best-looking home in no time. Let’s take a look! 1. Fresh Coat of Paint. Oh, the vast wonders that a can of paint can do. Not only is paint valuable on the inside of your home but it can immensely impact your outdoor area and ultimately, increase your curb appeal. For easy and budget-friendly updates, we recommend repainting items like your front door and window shutters, especially if they are in good condition. A simple coat of paint can bring your home back to life. It will help spruce up any unsightly marks and renews the appearance of your home’s exterior. The next step would be to replace outdated hardware like your door handles and house numbers. You will want to replace your door handles once you repaint your door to ensure no paint drips onto your new hardware. Also, it is important to replace house numbers because it is the first thing that guest will see when they come to your home. If you think about it, when you go to a location for the first time, you are essentially looking for their house numbers and in essence, directly at them. That is why you will want to replace rusted or worn-down house numbers with a more trendy set. Another simple tip is to replace your current mailbox. An outdated mailbox can bring down your curb appeal without you even realizing it. Luckily, replacing your mailbox can be inexpensive and a quick fix. 4. Plant Flowers & Trees. There is nothing better than a little nature for a gorgeous, colorful addition to your home’s exteriors. Try to incorporate some plants throughout your front yard for a little bit of greenery and beauty. Not only can exterior lights help with safety and security but they can also help your home look better during the nighttime. Plus, you may find it helpful to add a couple of lights surrounding your walkway to help you get to and from your home during the night. Maintenance is an essential part to curb appeal. Without proper upkeep, your yard could become messy and undesirable. Be sure to mow your lawn, rake away leaves, and sweep away debris from your sidewalk to keep your home’s exterior in tip-top shape. We hope you enjoyed these tips and tricks and that your home becomes your neighborhood’s shining star. Be sure to check back weekly for more design and decorating advice. Summer is already here! While you may have been procrastinating getting the patio squared away so far, it’s now time to shift your focus to this great entertainment space. Summer is a time to gather outside with friends and family, share a meal and enjoy the sunshine. While the cooler months may keep you indoors, summertime helps spread your home’s square-footage out a little more so you and guests have more room to relax. Here are some tips to get this vital space ready to receive guests so all you have to worry about is how much fun you’ll be having. Organization is your first task. Wayward items have a tendency of finding themselves in odd spaces when life becomes busy and the first place they end up is in rooms that are not seeing as much use. It gives the homeowner time to get things out of their way without putting it away. Now it’s time to clean that mess up. Place items in their proper storage units and survey the things that do belong in the room. Is there anything that can be thrown away from overuse or damage from previous seasons? Now is the time to remove it. Next, set any damaged but salvageable pieces aside so you can repair them. Place them in an area where they are out of the way but will not be forgotten. Make a list of items needed to fix them and go out as soon as you can to get them. Capitalizing on your momentum is what will see you through this project from beginning to end. Once you’ve got everything in working order, it’s time to clean the area. Wipe down plastic surfaces, clean or update your seat cushions and throw pillows and place some fresh potted plants throughout the space. Be sure to wipe down tables and chairs so guests won’t stain their hands when touching patio surfaces. If you have an outdoor rug, give it a good vacuum. 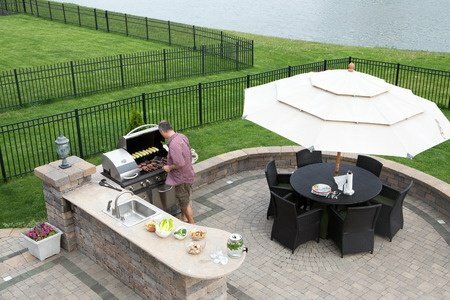 For outdoor grilling areas, be sure to wipe down food preparation areas and clean grilling utensils as well as your grill rack. Now get out there and enjoy the rest your summer! Porches are a long-time American favorite for homeowners who just love being outdoors. From reading a good book to conversations with friends, porches have a special place in all of our hearts. If you want to spruce up your porch for summer, we have five budget-friendly suggestions that will not break your bank. A reason to keep your head up: Porches are perfect for enjoying the warm summer months without having to be exposed to harsh sun rays. We are able to enjoy the beautiful weather because of the porch’s roof. You can paint the ceiling of the roof with a fun color to add uniqueness to the outdoor space. Guests’ eyes will be drawn to colorful statement piece and it can add brightness on gloomy days. Let’s hang around: Hanging plants are gorgeous and can bring serenity into the outdoor space. Try incorporating some hanging plants in a cluster, all with different lengths and styles. The hanging plants can add greenery and beauty quickly to your space without costing a lot of money. Mood swings: We mean the good kind of mood swing, of course. Adding a swing can easily turn a bad day into a great day. Swings are proven to help create relaxation just with a few simple pushes. If you are looking to save money, look for older, used swings from thrift stores and just apply a few coats of new paint. 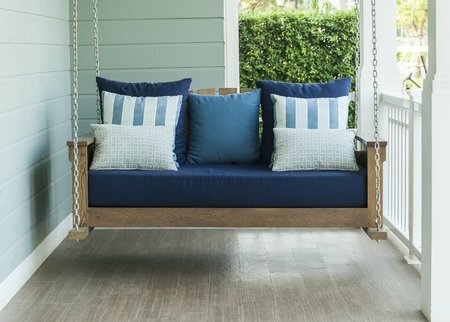 Favorable finishes: If you have porch furniture, add some pillows and throw blankets on top of the couches and chairs. They will help give the outdoor space a more cozy and lived-in look. Add some outdoor candles to bring warmth to your outdoor escape. Timeless touch-ups: House numbers, the front door, and the porch’s exterior paint can be touched up to improve the appearance and quality of your porch. A new front door may be the most expensive suggestion, but take the time to save money for this investment. Buy some new house numbers that tie in well with your outdoor space and apply paint touch-ups wherever needed on the porch’s exterior. We hope you take advantage of these simple suggestions and enjoy a relaxing, peaceful summer on your porch. It is officially the season for barbecues, pool parties, and outdoor entertainment. With the weather warming up, homeowners can look forward to having the chance to entertain outdoors. It is no secret that with hosting guests comes a lot of time and planning. Put your mind at ease this summer by following our easy guide to having an outdoor party. Invites. With every great party comes a guest list. First, you will need to decide on the size of your party. Who are you inviting to the party: is it family only? After you decide on how many people you are inviting, you can set a theme. Are you planning on having a barbecue, pool party, dinner party, etc.? Are children invited? Seating. Unless you are planning on having everyone stand the entire time, it is important to make sure you have enough seating options for guests. Things to consider are: if people will outdoors the entire time or if you are having the party be inside and outside. If you are having the party inside and outside, you can get away with providing less seating outdoors. If you are having the party only outdoors, consider a number of people coming and where you want them all to sit. Tables. You can set the table similar to how you set your table inside. But instead of using cloth napkins, use paper napkins to make it more casual. If you have enough placemats, incorporate them into the table’s design. Try adding a fun centerpiece from your house to draw guest’s eyes towards the tables. The Meal. If you are serving food outdoors, make sure to place it in a shady area. Avoid direct sunlight because it can cause your vegetables to wilt. Your best bet is to serve food that is good at room temperature (grilled kebabs, noodles, beans, etc). Lighting. Light up the night with some stringed lighting and candles. You can string the lighting throughout your trees, bushes, and fence. Your candles can serve as a centerpiece during the day and light up your space at night. Try incorporating some insect repelling candles to avoid having your guests get bitten. Decor. You can decorate the party with your indoor decorations to save time and money. Take some of your favorite decor pieces from inside and incorporate them into the outdoor’s design. You can have an outdoor party for basically any reason nowadays. From graduations to get-togethers, our outdoor entertainment guide can help you create the ultimate party. Fall has arrived and with Halloween just around the corner it is the perfect time of year to start thinking about fun dates that can help to spice things up during the cold months. Besides, after all of the summer months of hot weather, it will be nice to get out into the fresh, crisp fall weather. Especially with it being so close to Halloween, a little fright night might be just the thing to bring you and your partner closer. A haunted house is just the thing to add some thrills to the holiday season. Grab a bite to eat before and then head to the haunted house for a some fun scares. If your town doesn’t do haunted houses look into haunted hayrides. The haunted hayrides may also be more appropriate for nights you can’t find a babysitter and the kids need to come along as well. Another great date night for the fall is to find the closest apple orchard and take your partner apple picking. It’s the perfect activity to enjoy sparks between you, as you stroll through the apple orchards in the beautiful fall weather. With nothing to distract you from one another you are sure to enjoy stimulating conversation with one another while getting in a leisurely workout outside. To top the night out, bring the apples back and bake a delicious apple pie you can enjoy together. Finally, what else could be better then spending the night carving pumpkins with each other. Perhaps carve them over your favorite scary movies, but be careful for the jump scares when you are using your pumpkin carving knife. Once you have your carvings perfected, roast the seeds for a side snack for the rest of your night. If you have children, you can include them too! Just be sure to chose a scary movie more geared towards their appropriate age. The kids are sure to love the roasted pumpkin seeds. Whether you chose a romantic date night for just you and your partner to enjoy welcoming fall, or you also include the kids in on the fall fun, you are sure to have a great night out enjoying the cool fall weather.